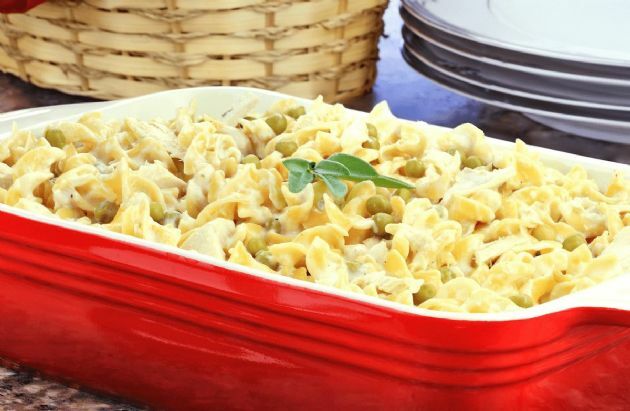 This comfort food classic is great for a family dinner. Members turn to this meal again and again for good reason: It's easy, tasty, and ready in just 30 minutes! This comfort food classic is great for a family dinner. Members turn to this meal again and again for good reason: It's easy, tasty, and ready in just 30 minutes! Boil noodles until done, set aside. In a large bowl, combine drained tuna, soups, peas, and noodles. Put in an 8.5x11 casserole dish. Cook for 20 min at 350'. After 20 minutes, sprinkle cheddar cheese and bread crumbs on top and return to oven for 10 minutes. Makes 6-1 cup servings.